One of the most difficult tasks facing the foreign policy makers in India is the requirement to balance the relations with Iran while enhancing proximity with the United States. This invariably raises questions over the importance of Iran. An ancient civilisation, Iran is located at the crucial junction of South Asia and the Middle East. It also links the Central Asian Republics and the Caucasus region to the Arabian Sea. Historically, it has influenced its neighbours, irrespective of the type of government in power. The book covers the developments in post colonial Balochistan, its geo-political significance, and the underlying grievances of the Baloch. It makes an attempt to analyse the reasons for current revival of violence in Balochistan and highlights the current situation in the region. 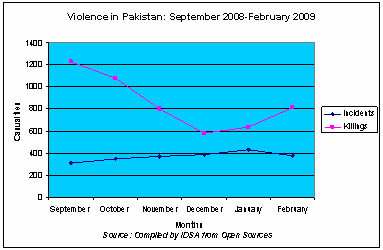 The month of May 2009 was the most violent month in Pakistan in the last five years. As the security forces launched a concerted operation against the Taliban in Malakand Division, the casualties shot up almost five times. The month recorded 504 violent incidents against 332 in April, which resulted in the loss of 2,585 lives. Most of the casualties were due to Operation Rah-e-Rast launched by the security forces in Swat and adjacent districts. April saw the foot soldiers of Taliban moving to Buner and Dir, after consolidating their position in Swat. The march of Taliban to Buner, which is separated from Islamabad just by the district of Haripur created a fear psychosis in the minds of the ruling elites in Islamabad. The shock and awe that Taliban had managed to create was clearly evident as the Pakistani parliament pushed through Nizam-e-Adl resolution, without refering it to any parliamentary committee on April 13. Consequent to the peace deals signed by the Pakistani state with Taliban, the number of terror-related incidents in March came down in regions, which have been afflicted with violence in the recent past such as NWFP, FATA and Balochistan. 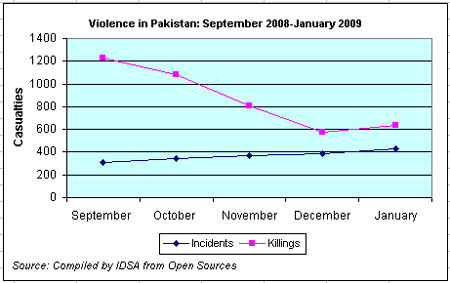 However, there was an increase in terrorist violence in other parts of Pakistan, thereby indicating a shift of Taliban’s theatre of operations from its traditional conflict zones to the heartland of Pakistan. Highlight of the month was the peace deal signed by the NWFP government with the founder of Tehrik Nifaz Shariat-e- Mohammadi (TNSM), Sufi Mohammad. The deal did bring some ‘peace’ to the restive region but virtually handed over half the territory of NWFP to the Taliban by accepting Shariat laws for Malkand Division and Kohistan district of Hazara Division. 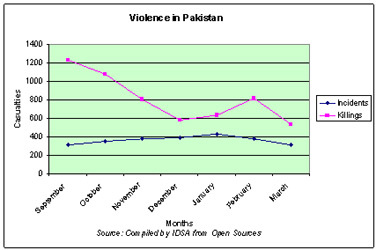 As a result, the number of terror related incidents in Pakistan decreased from 430 in January to 374 in February 2009. The first month of the new calendar year saw a reversal of the trend of declining casualties witnessed during the last three months, whilst the incidents of violence continued to rise constantly maintaining the trend of last three months. The withdrawal of ceasefire announced by the Baloch nationalist groups in September 2008, saw a sudden spurt in casualties in Balochistan. 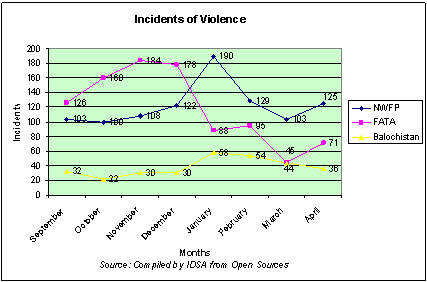 During the month the incidents of violence increased to 430 from 388 in December 2008. This year Pakistan is facing an acute water shortage and the shortage during the current Rabi crop is estimated to be around 35 to 40 per cent, which will adversely affect the wheat output, critical for the country’s food security. Pakistan also faces an acute power shortage, which has exacerbated by the reduced outflow from Tarbela Dam. To tide over the problems, Pakistan is building Bhasha Dam on River Indus, which is the largest dam being built in Pakistan since Tarbela was completed in 1976. Continuous silting has reduced the storage capacity of Tarbela and Mangla dams considerably. Amidst apprehensions of a conflict between India and Pakistan after attacks on Mumbai on 26 November, as Pakistani security forces ostensibly diverted their attention from the Western to the Eastern borders, terror related violence showed an increase from 372 in November to 388 in December. Although there was no movement of troops from the Western borders to the East, Pakistani security forces allowed vast tracts of land in FATA and Swat Valley go under the control of Taliban.